When you learn stock trading, the first few months are the most dangerous. So many new stock traders blow up their account before they even know what is happening. One of the biggest causes of this early blow-up is incorrect approach to position sizing. Calculating position size consistently across all of your trades will stabilise your account and normalise your risk so you don't get killed if one of your stock trades goes bad. In this video I explain how to calculate position size so you are consistent across all of your positions. 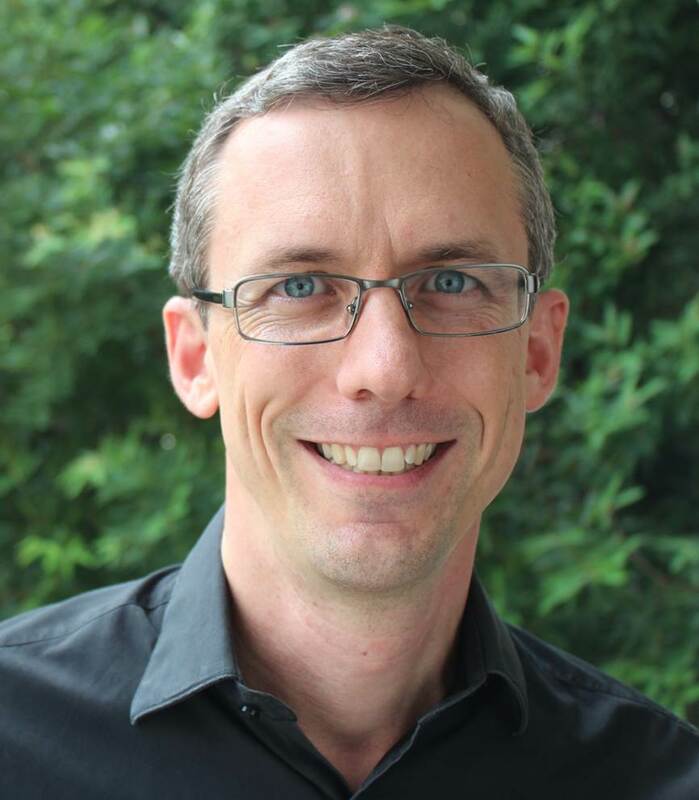 Hi, Adrian Reid here and in this private email coaching program video, I'm going to be talking about how to calculate your position size for any trades that you want to make. This is one of the most important lessons when you learn stock trading. The first thing we need to look at before we take any trade is understanding the risk per share or per contract so that we know on what basis we're going to size our positions. Let's say we're going to take a trade in this instrument and this bar here is our entry bar. 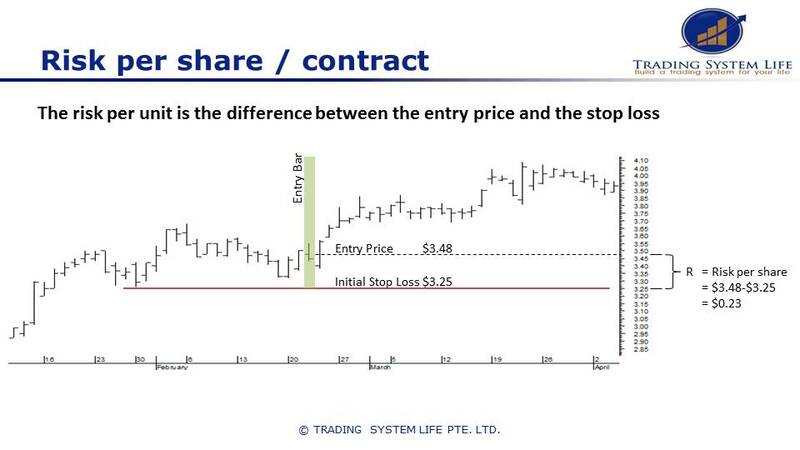 Identify that we get an entry signal right here at a price of $3.48, for example. The first thing we do is we set our stop loss according to our stock trading system rules. That could be volatility based, it could be chart based. This stop loss here is based on a certain multiple of volatility of the average true range but there's any number of ways you can do that. We've got an entry price of $3.48 and we've got initial stop loss on this share of $3.25. That gives us a total risk per share of 23 cents. If we're wrong on this trade and we have 1 share, our loss will be 23 cents. Our job now is to figure out how many shares we should buy given this risk per share of 23 cents and the size of our account. To calculate the position size on a trade, use a simple formula which is basically equal to the number of units that you buy is equal to the equity that you have in your account times the risk per trade that you want to take, divided by the risk per unit. 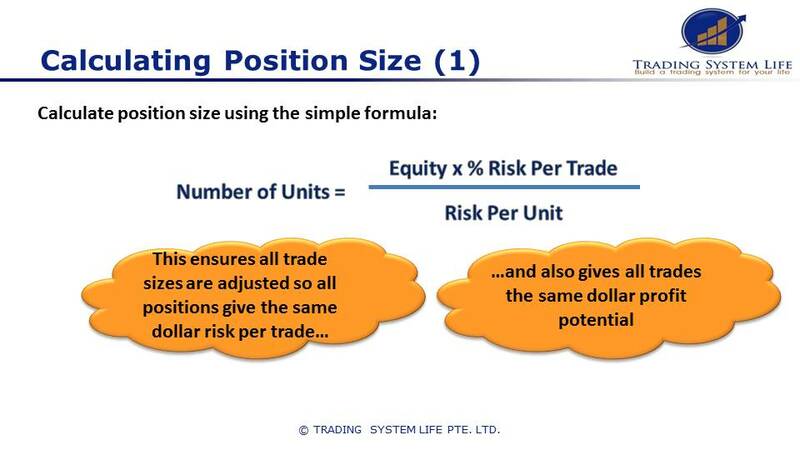 Position sizing formula for stock trades. This is one of the most important formulas when you learn stock trading. Equity is the total amount of money in our account, or how we measure equity there's a number of different ways to measure equity; Multiplied by risk per trade, so you might be risking say 1 percent of your account on each stock trade. That means if you're wrong, you'll lose 1 percent of your equity on this trade. Then you divide that by the risk per unit which we calculated on the previous slide to determine how many total units we can buy. The reason we do this is because it ensures that all trade sizes are adjusted so that the positions give the same dollar risk portrayed. What we want to avoid as a trader is having say a $500 loss on one trade, and a $3,000 loss on another, and a $10,000 loss on another, and a $2,000 loss on another because we've got different position sizes all over the place. One of the first steps towards consistency when you learn stock trading is standardizing your position size so that if you're wrong, you'll lose the same amount on each trade. What you'll find is as soon as you do that, you get much greater consistency of returns and a much greater sense of confidence because you know how much you're going to lose when you're wrong and you know how much that's going to impact your account and you can then start to manage your risk a bit more successfully. It also gives trades the same dollar profit potential. If you size your trades based on say a volatility stop loss, it gives each of your trades an equal chance for success and an equal chance for failure. If you buy a $50,000 position in Facebook and a $2,000 position in Apple, for instance, then the Facebook position is going to have a much higher level of risk and a much higher potential for dollar profit than the Apple position. What we want to do with this formula is to standardize the amount of profit and loss potential that we've got on each of our trades. Let's take an example. Again using the same chart that we talked about before, let's assume we have $10,000 of equity and we want to risk 1 percent per trade. How does the calculation work? 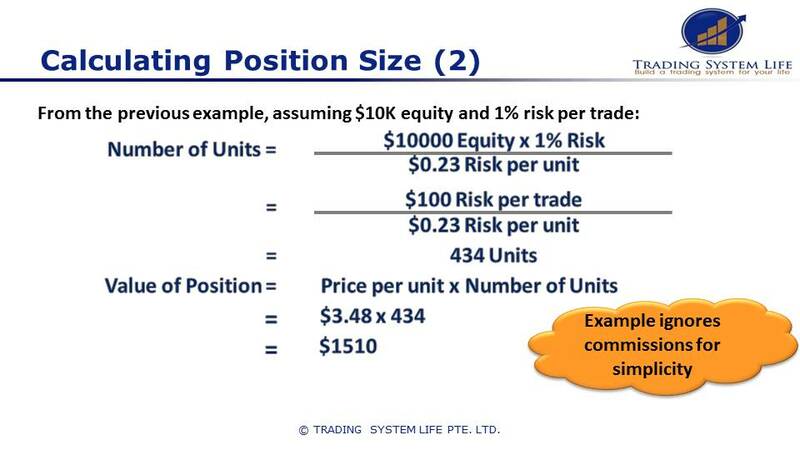 Position sizing example to help you learn stock trading safely. The number of units is equal to the $10,000 of equity times your 1 percent risk; Divided by the 23 cents risk per unit or per share that we calculate. Note here I'm ignoring commissions for simplicity. We'll just go through the basic numbers and then you can add in commissions to make it a bit more realistic. That equals $100 risk per trade. That's your thousand dollars equity times 1 percent; Divided by 23 cents per share, per unit. That gives you a total of 434 units that you're allowed to buy in order to risk 1 percent. On that previous chart if we risked ... If we took that trade, we bought 434 units. If we were wrong and our initial stop got hit and we got out, we'd be losing $100 or 1 percent of our $10,000 account. What's the value of that position? That's the price per unit which is just the share price; Multiplied by the number of units that we're going to by. In this trade that's $3.48 times 434 units which is $1510, so that's $1510 position which gives you 1 percent risk or $100 risk on that trade in your $10,000 account. The reason we do this, we want to risk a small amount of our account on each trade so that we can be wrong many times in a row. Let's take a look at what this looks like. Let's say you've got your total equity. We want to risk only a small percent of our account on each trade; Say less than 1 percent. The reason we do that is so that if we're wrong several times in a row, we don't lose too much money. 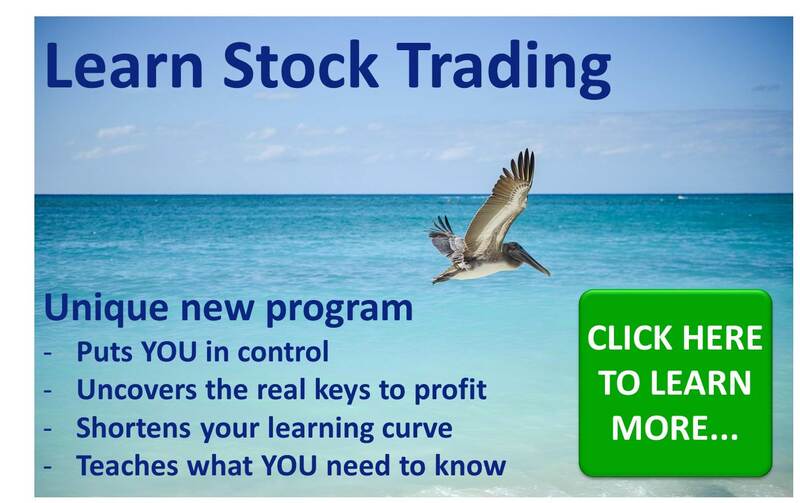 Success when you learn stock trading is actually about avoiding significant losses as much or even more than it is about making significant gains. Let's have a look at some examples here where we risk half a percent, 1 percent, 5 percent and 10 percent of our account on each trade. Why position sizing should be conservative when you learn stock trading. If we're wrong once and we risk 10 percent of our account, then we're already down to 90 percent of the original. Start with $100, we're down to $90. If we take a second trade and we lose, then we're already down to $80 or so. By the time we've taken 10 losing trades in a row, if we're risking 10 percent of our account on each trade, you're already down to $34 from your starting point of $100. Obviously based on that, risking 10 percent of your account on each trade is way too much. Let's have a look at some other examples. If we risk 5 percent of our account on each trade and we get 10 losing trades in a row, then we're down to about $59/$60 at the end of that. If we risk only 1 percent and we have 10 losing trades in a row, then we're down to $90. If we risk only half a percent, then after 10 trades we're down to only $95. 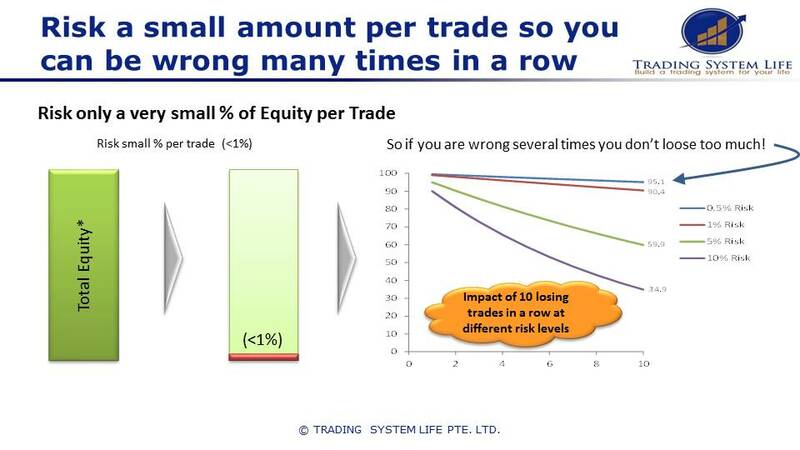 What you can see is that the smaller amount you risk per trade, the more losing trades you can have in a row without badly damaging your account. I would certainly advocate for most people to consider risking even less than what you already are. If you're risking in the vicinity of 5 or 10 percent, then chances are you're risking way too much money on each trade. Have a good look at how many losing trades you can potentially get in a row and then consider reducing your risk so that you're not damaging your account if you get a string of losing trades. 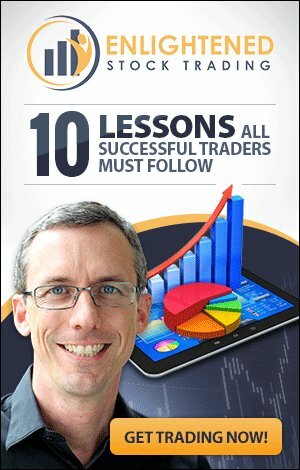 You might think, "10 losing trades in a row, who would be so stupid as to be able to lose that much money." If you're a trend follower, then you're going to make all your money on a small number of trades, and you're going to have a large number of small losing trades. Let's say you try the trend following system like I do, you might be risking ... You might be right 30 percent of the time and wrong 70 percent of the time. Now, that sounds pretty bad except when you realize that when I'm wrong, say I lose $1,000; But when I'm right, maybe I make $10,000. When the size of the losses is a lot smaller compared to the size of the gains, you can actually afford to have quite a low reliability or a lot of losing trades. But what you need to consider is that if you've got only say 30 percent winning trades, 70 percent losing trades, you can actually get a very long losing streak and that's why you need to be risking a small percentage of your account on each trade. Let's look at what this actually means if you get a big loss or a drawdown in your account. What I've got here is a level of drawdown and then in the next column, how much return you have to make in order to recover your initial account size. Big drawdowns are particularly scary when you learn stock trading, so this is something you are going to want to understand! 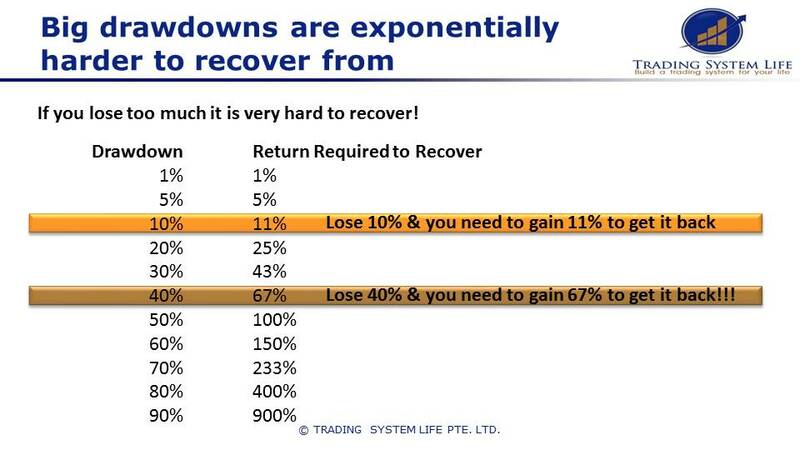 Be careful of big drawdowns while you learn stock trading. Let's say you have a drawdown, you lose 10 percent of your account so you started at $10,000, you lose 10 percent; You're now down to $9,000. In order to get back to your initial $10,000, you need to make 11 percent because of the asymmetry of returns; Losing 10 percent means you have to make 11 percent back. That's pretty similar so that's not such a big deal but when you start to get bigger and bigger drawdowns, this becomes more and more of a problem. Say you get a drawdown of 40 percent; You start at $10,000 and your account drops to $6,000, 40 percent drawdown. In order to get back to your original $10,000, you now need to make a 67 percent return in order to get back to where you started. You can see the challenge in breaking even and going on to make a profit. If you lose half your account; So your $10,000 is down to $5,000, you then need to double your money from $5,000 back up to $10,000. You need to get 100 percent return just to break even. You can see that the biggest challenge or the biggest driver of success in trading is going to be limiting your drawdown so that when you go on to make more money, you don't have to make excessively higher returns to get back to where you were and move on to greater and greater profits. You should always be aiming to keep your drawdown in this sort of low range here, because that way you can very easily go on to make new account highs. If you're having big drawdowns like 40 to 70 percent or more, then it's almost impossible to get back to where you started. That makes it very difficult to make money trading in the long run. I hope this has been helpful; That's just a quick video lesson for my private email coaching clients. If you are interested in finding out more about my Private Email Coaching Program, just click the image below and register to find out more! Thanks very much. Trade well.